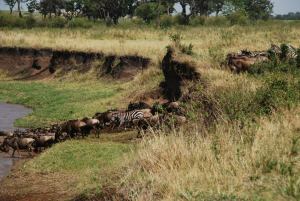 One of or blog posts from our archives , as we await the wildebeests to cross the Mara river. Could the Great Annual Wildebeest Migration have arrived too early this year? Some AWESOME news we are receiving from the ground is that indeed the plains are strode with the Loita herds. Our guides on the ground have had excellent safari experiences in the Mara past two weeks, reporting huge herds across the horizons around the Musiara and Serena areas. 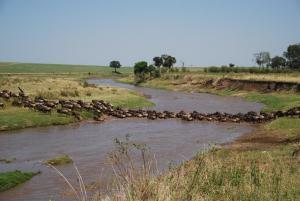 But this we did not expect… News from Cottars 1920s Camp Masai Mara indicate that on May 23rd, the initial herds of wildebeest and zebra began crossing into the Masai Mara at the Sand River near Cottars 1920’s Camp. This has been confirmed by the Mara Triangle socialite; vast hordes now scattered all over the Mara Triangle and game viewing is ever more excellent. Previous Post Charity Cycling Safari is here!